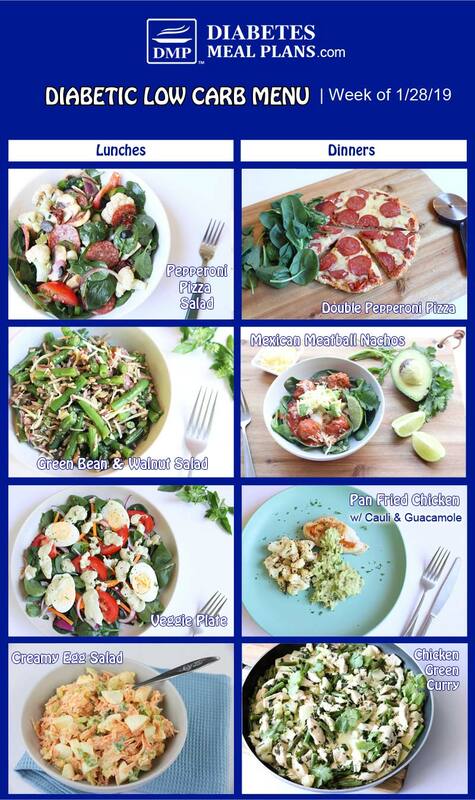 This weeks menu features an amazing pepperoni pizza, spicy Mexican meatball nachos, a very tasty green bean salad, easy chicken green curry, and more – enjoy! TESTIMONIAL: “I’ve been following your plans for about a month now. My bs range was 150 to 185 for am fasting. Now it’s ranging from 105 to 140.” ~Sharlene, VIP Member. TESTIMONIAL: “I love the cooking ideas and variety of the meal plans and all the educations information. Most diabetic cookbooks and websites allow too much rice, potatoes, pasta, bread and even sugar(!) in their recipes. DMP has realistic carb info and delicious food recipes too.” ~Adele, VIP Member.